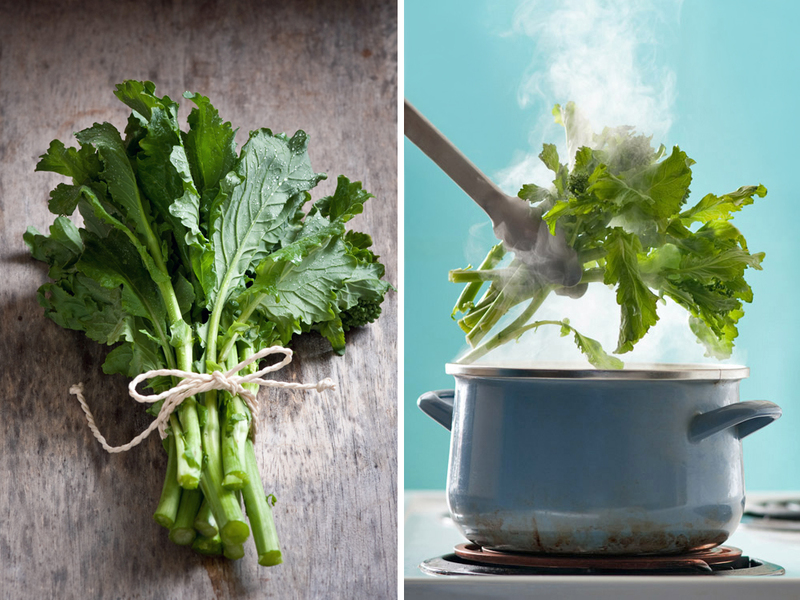 These super healthy greens go by many names. 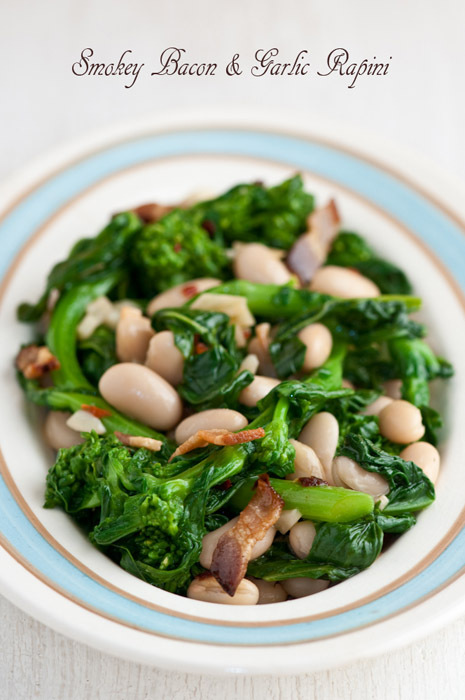 In Naples they are called Friarielli, in North America they are Broccoli Rabe or Rapini. Rapini can be kinda bitter depending on how it's prepared. Blanching the greens in some stock, then shocking them in cold water before a quick sautee can take the edge off, so will a squeeze of lemon right before serving. 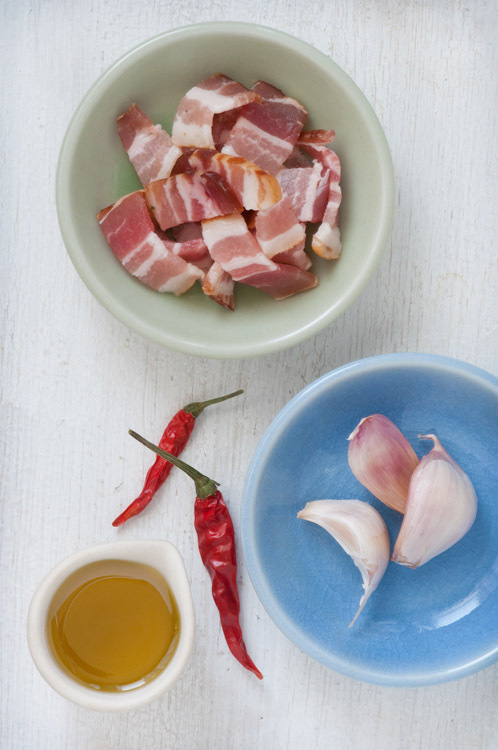 Of course, there's always bacon, almost everything tastes better with bacon. I like to combine rapini with local Sweet Williams smoked bacon, garlic, and some crushed chili. 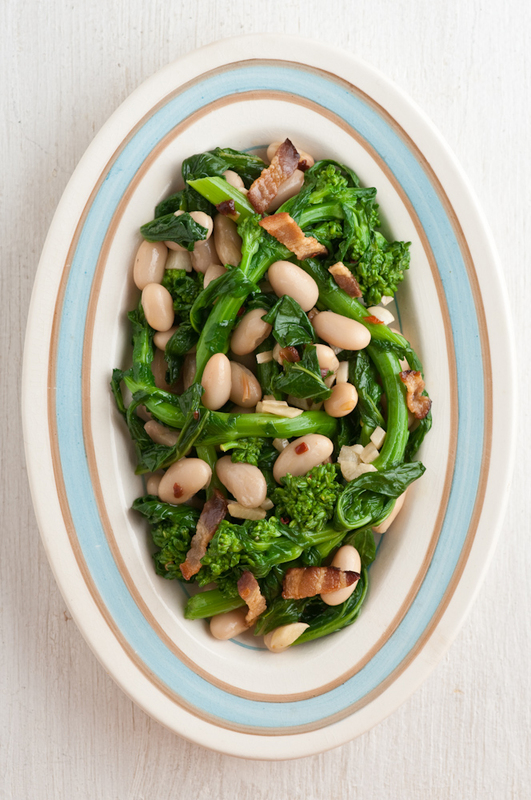 Tossing the greens with smokey white kidney beans makes the dish even better. When I prepared this, I had some of my slow cooker, smoked ham hock beans on hand, the results were far superior to earlier versions using canned white kidney beans. So, I'll include that recipe in a future post. To prepare the greens- first cut off bottom inch or so of the stalk, and use a vegetable peeler to remove the outer tough peel from the stalk. Coarsely chop the larger outer leaves, discarding any with yellowing edges. Rapini gets more bitter the longer it's stored, so select only the freshest looking greens and use promptly. Bring the stock and water to the boil and add the rapini, reduce heat and allow to simmer gently for 3-5 minutes, until just tender. Remove from heat and drain. Rinse in cold water to stop cooking, drain and set aside. These pretty little frilly greens are so rich in nutrients that they will likely cure whatever ails ya. This recipe served along side a flavourful stuffed pork tenderloin** and we have a Sunday dinner.